From US Highway 71 in Rich Hill, go east on B Highway for 9 miles to O Highway. Turn right (south) and go1/2 mile. Cemetery is on east side of road. Continue south on the road and you come to the town of Prairie City. d. 1889 or 1898 ? This photograph (tintype) was taken in the late 1800’s of G.W. Sunderwirth’s store in Prairie City. The location is where the Church of Christ now stands. In the photograph are G.W. Sunderwirth, his wife Dela (Schneiter), Clara Schneiter and Peter Bartz. 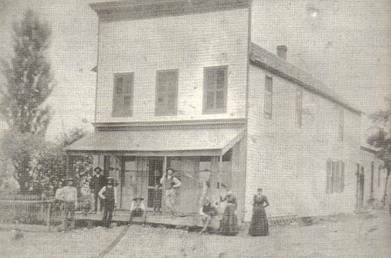 The Sunderwirths lived in a two-story house across the street from the store. G.W. 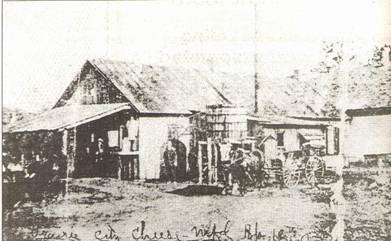 Sunderwirth also operated the cheese factory in Prairie City at one time. He is buried in Prairie City Cemetery. The Prairie City Cheese Factory was the oldest continuously operating cheese factory in Missouri. It lasted for 84 years and shipped cheese throughout the U.S. This photograph was taken in the early 1900’s. This building was later replaced with a more modern concrete block building. The factory was closed in the late 1960’s. It was located in downtown Prairie City. Prairie City was laid out by Joshua N. Durand on May 2, 1858 and so named because of the beautiful prairie surrounding it.